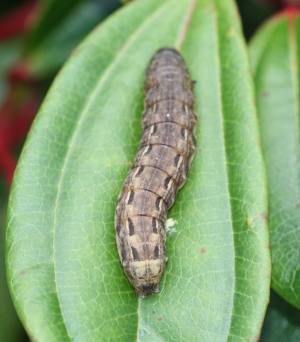 Observation - Larva of Large Yellow Underwing moth - UK and Ireland. Description: 5cm approx. Grey/brown body, oblong shaped black marks along the side of the abdomen, above a white line. Indistinct dorsal line. 5cm approx. Grey/brown body, oblong shaped black marks along the side of the abdomen, above a white line. Indistinct dorsal line.